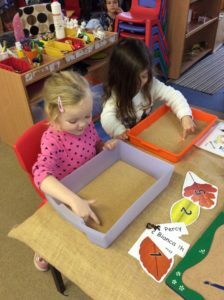 We have also used sand to encourage literacy this week. 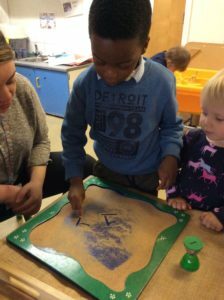 This has been a great source of interest and the children have had a go at writing their names, numbers and drawing pictures in the sand. 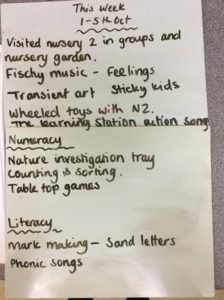 We now have a weekly activity log on the door as you leave so please feel free to have a read at your leisure. 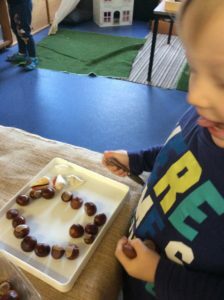 There are always exciting things happening at nursery! We will be having a Halloween party on the 31st. The children can come in fancy dress but this is not compulsory. 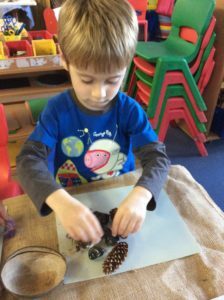 We will carve pumpkins have party games and make Halloween crafts.